Slacklace Review and Giveaway! | So What? I run. FINALLY! I’ve been waiting to do this review for a month. 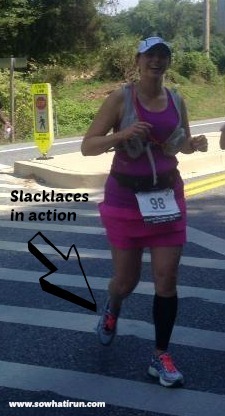 Soon after I received the Slacklace shoelaces, I ended up with a calf injury before I could even use them. Although I’ve used these in the past, I wanted to give them a fresh review, so I waited. I was first introduced to Slacklaces at a race last year and I fell in love with all of the bright colors (they have 13 to offer) that I just had to accent my shoes with them while I was training for the Baltimore Marathon. Slacklace are elastic shoelaces by Yankz! that eliminate banding and pressure points. What I like about Slacklace are the bright colors and the ease of slipping your shoe off and on without having to untie your shoe. Because the top of my feet arch up, I already have to lace my shoes a little differently to alleviate pressure on the top of my feet, however because these laces lay flat, I find that I get additional relief by using them. When you lace your shoe with Slacklaces, do it with your foot in the shoe and don’t tighten them too much. I found it easier to tighten them after I laced them to the top than an it was to loosen them. Again, don’t tighten them too much. You don’t need to. I made the mistake of a last minute adjustment right before the 20-miler to tighten my right shoe “just in case” and I was wrong to do so. Ended up with a little blister where my tongue rubbed the top of my foot. My left shoe was perfect. I should’ve left the right one alone. Make sure you get the right size. Slacklaces come in different lengths, so make sure you get the right length for your shoe, otherwise, you’ll end up tying them too tight. Don’t forget to account for different shoe types. For example, minimalist shoe vs. high tops. Have fun with the colors! Why not have one color on one shoe and a different color on the other? And we have a Giveaway! Yankz! 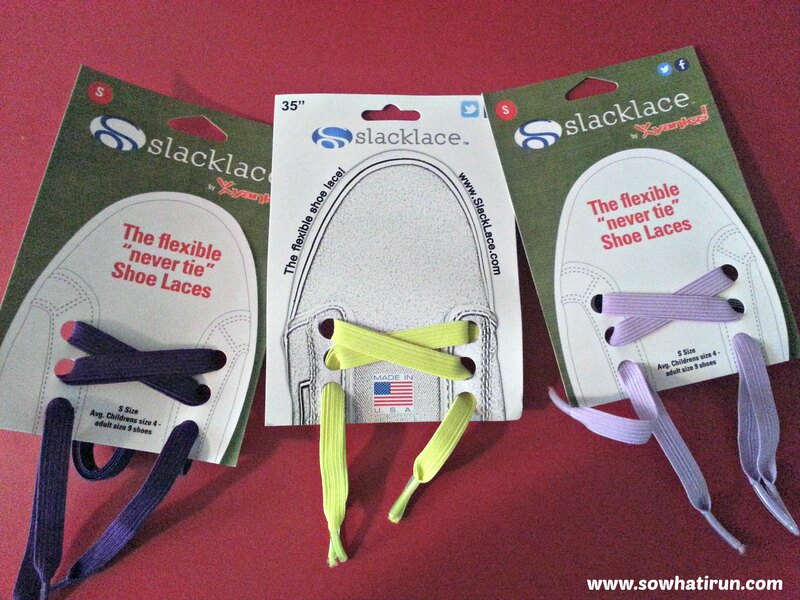 were kind enough to offer 3 pairs of Slacklace to So What I Run readers! All 3 pairs are a size Small which will fit average Children’s size 4 to adult size 9 shoes. Click on the link below to enter. Although I have purple, yellow, and lavender, I cannot guarantee the color selection that you receive. This entry was posted in Product review and tagged Accessories, athletic laces, Footwear, shoelaces, Slacklace, Slacklaces, Yankz by SoWhatIRun. Bookmark the permalink.